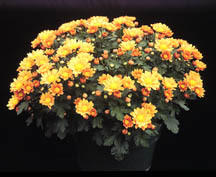 Fleurettes, a cross between a domestic and a wild, Asiatic chrysanthemum, are naturally compact and, when in bloom, are topped with a profuse number of one-inch flowers. According to a report from Yoder Brothers, this crop is a short-day plant with a critical daylength of 12 hours. To induce the plants to flower, black cloth is required from mid-March to mid-September. Due to the compact nature of the plants, it is recommended that they be produced in 3" to 4" pots or in 5" to 10" bulb pans. Since its introduction several years ago, most growers have been producing this crop in 3" or 4" pots. When grown in small containers, typically one cutting is planted per pot and the cutting is pinched once, 10 days after planting. Using this schedule, most plants produce approximately 50 flowers per pot and the product is suitable for use as a personal gift. Alternatively, multiple cuttings can be planted in bulb pans. Depending on the cultivar and the number of cuttings planted per pot, each finished product will be covered with a few hundred flower buds, resulting in a beautiful plant that can be used as a centerpiece. At the University of Massachusetts, the Fleurettes produced by students in the Greenhouse Crop Production class received many rave reviews suggesting that it may be used as an alternative pot crop for growers who are looking for something new in their program. Our cultural schedule was as follows: Five Fleurette cuttings were planted in each 6" bulb pan in early September. Two cultivars, 'Cherry Papillon' and 'Bronze Cherie' were grown. Plants were then placed on a long-day bench for 2 weeks before pinching and the beginning of the short-day treatment. The crop was produced in a greenhouse with day/night temperatures set at 72/63º F and fertilized with constant liquid feed at 200 ppm N. Four weeks after the beginning of the short-day treatment, plants were sprayed with 2500 ppm of B-Nine. Plants were ready for market after 7 or 8 weeks of short-day treatment for 'Bronze Cherie' and 'Cherry Papillon', respectively. At the time of marketing, there were differences in the growth habit of the two cultivars studied. On average, 'Bronze Cherie' had 324 flowers per pot, 90 flowers more than that of 'Cherry Papillon' (Table 1). However, the flowers in 'Bronze Cherie' were more closely spaced so that the final width of the products was still less than that of 'Cherry Papillon'. The growth of 'Cherry Papillon' was more vigorous than 'Bronze Cherie' resulting in an overall larger plant. The width, in combination with the height of less than 12 inches, makes both cultivars an ideal product for use as a centerpiece. The sharp contrast of the dark maroon petals to the yellow center of the 'Cherry Papillon' daisy flowers resulted in a stunning product ideal for holiday sales. The bronze color of 'Bronze Cherie' makes it an ideal crop for the autumn. Both cultivars have a very good display life although the petal color of 'Cherry Papillon' rapidly faded once the plants were moved out of the greenhouse. This suggests that retailers should minimize the length of time that 'Cherry Papillon' are left in an indoor retail setting. Table 1. Growth data of two cultivars of Fleurettes. Currently, there are many cultivars of Fleurettes available through Yoder Brothers with colors such as white, yellow, pink, red, and bronze. The wide array of colors allows growers to select cultivars that meet the needs of the market. Furthermore, the basic cultural practices of Fleurettes are similar to that of pot mums. Growth is fairly uniform and there are few production problems. The direct cost of a 6" Fleurette is less than that of a 6" pot mum because the prices of the cuttings are comparable while the total production time of Fleurettes is shorter. Overall, this lovely product would be an excellent addition for growers who are searching for a new pot crop to produce.